We were approached by the Alif Baa founder with a vision of creating a learning tool, using gamification for young children wanting to learn the Arabic alphabet. The app was to involve 4 separate games, each contributing to the child’s learning in different ways. One of the main challenges of this project was designing a child friendly Arabic alphabet that could be used within the app. Each letter was designed and then converted into native code in vector format. This allows us to store all the letter graphics within the app while using a fraction of the storage that exported images would have used. It also has the benefit of looking just as crisp on a large iPad pro compared to a small iPhone. The first game focuses on identification of each letter. 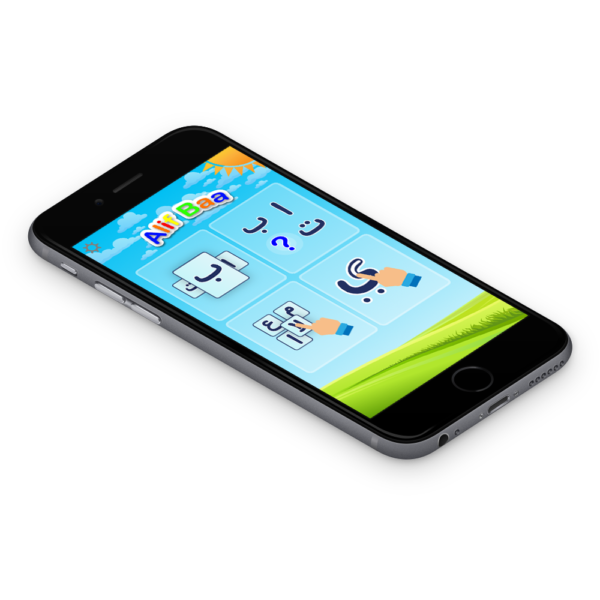 The game allows children to swipe through ‘flashcards’, increasing their familiarity with each letter. Once tapped a card is flipped, revealing an animal and reads the letter out. The second game takes the lessons learnt from game one and gets the user to identify each letter from a choice of 4. Letters can be randomized to increase difficulty. The third game contains a drag and drop interface and children must order the letters according to the order presented in game 1 and 2. This games tests that the child can both recognise each letter as well as their order. Each correct drag and drop is accompanied by a success tone and once the game is complete the user can record their time and share with friends and family, as well as enter global leaderboards. The final game aims to improve a child’s handwriting skills, by guiding them through each stroke of every letter of the alphabet. The user can also choose their own word of phrase to practice, allowing children to practice writing their name or other words. The Alif Baa app was a pleasure to work on, and we know that it has already helped thousands of children across the world with learning the Arabic alphabet. It is currently available on iOS and can be downloaded from the App Store.